The Xbox division of Microsoft and LucasArts unveiled a limited edition Star Wars-theme Xbox 360 at the 41st annual Comic-Con International. The custom themed 360 unit bears resemblance to the two beloved droids of the franchise, R2-D2 and C-3PO, a fan-magnet if I ever saw one. Kudos to Microsoft for coming up with this one. The Limited Edition Star Wars Xbox 360 will only be available as a bundle which includes the R2-D2 blue-and-white themed console, a custom Xbox 360 Wireless Controller inspired by C-3PO and the first ever white Kinect sensor. 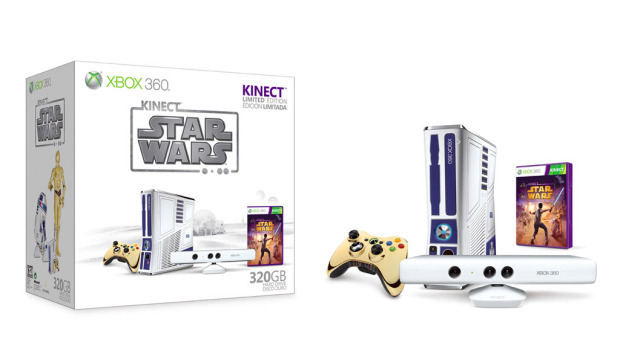 The Xbox 360 Limited Edition Kinect Star Wars Bundle is set to arrive at stores alongside the release of the Kinect Star Wars game but is now available for pre-order. The Star Wars bundle is priced at $449.99.